The ATLAS inner detector barrel comes one step closer to completion as the semiconductor tracker is merged with the transition radiation tracker. 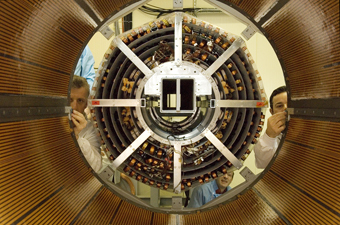 ATLAS collaborators prepare for the insertion of the semiconductor tracker (SCT, behind) into the transition radiation tracker (TRT, in front). Some had hoped it would fall on Valentine's Day. But despite the slight delay, Friday 17 February was lovingly embraced as 'Conception Day,' when dozens of physicists and engineers from the international collaboration gathered to witness the insertion of the ATLAS semiconductor tracker into the transition radiation tracker, a major milestone in the assembly of the experiment's inner detector. With just millimeters of room for error, the cylindrical trackers were slid into each other as inner detector integration coordinator Heinz Pernegger issued commands and scientists held out flashlights, lay on their backs and stood on ladders to take careful measurements. Each tracker is the result of about 10 years of international work, with a combined value of several tens of millions of Swiss francs. 'I was going to say that today's the crunch,' said Pippa Wells, who is replacing Mike Tyndel as the semiconductor tracker's project leader. 'But today there should be no crunch.' And thanks to the driving skills of project engineer Marco Olcese, there wasn't. By the end of the hours-long event, the two sub-detector units became one without any harm coming to the fragile equipment. The semiconductor tracker (SCT) and transition radiation tracker (TRT) are two of the three major parts of the ATLAS inner detector. Together, they will help determine trajectories of particle collisions produced when the LHC is switched on. Merging the two barrel trackers is a major step for the ATLAS inner detector, but just a part of the entire process. 'The challenge is to take it from these completed objects to something that works well together,' Wells said. 'The ultimate aim is to get it ready to do physics.' The SCT and TRT end caps are the next to be completed and inserted. The third and final part of the inner detector, called the pixel detector, also needs to be added in the very centre of the tracker. The present goal is to test the combined SCT-TRT barrel in the coming months and lower it into the ATLAS cavern this summer.